Researchers found significant dune erosion that swept away some nests and exposed the eggs of others. It was a record year for green turtle nesting along the refuge’s beaches in southern Brevard County, but storm surge due to hurricane Irma destroyed many unhatched loggerhead and green turtle nests. 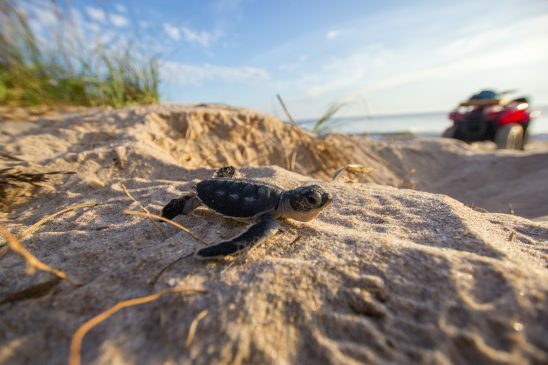 UCF researchers estimate that of nests laid through the end of September, more than half of the season’s green turtle nests and a quarter of loggerhead nests were lost. Both species are listed as threatened under the U.S. Endangered Species Act, and Florida hosts the majority of both species’ U.S. nests. The section of the Archie Carr National Wildlife Refuge monitored by UCF hosts about a third of the Florida’s green turtle nests. Green turtles set a new record in 2017, laying 15,744 nests in the sands of the 13 miles of the Brevard County portion of the Archie Carr National Wildlife Refuge monitored by UCF. An estimated 8,830 of those were lost to the storm. Green turtles nest later in the season than other species, so many of their eggs hadn’t hatched by the time Irma hit. Some 56 percent of total green nests were lost, an estimated 81 percent of those that were still incubating. Along the same stretch of beach, loggerheads laid 9,690 nests in 2017, but most had already hatched when Irma passed through the region. Still, an estimated 2,290 loggerhead nests were lost. That’s 24 percent of the total loggerhead nests and 91 percent of those that were still incubating when hurricane-driven storm surge came ashore. The UCF Marine Turtle Research Group also found evidence that some green turtle hatchlings have emerged since the hurricane. And some turtles have continued to come ashore and lay new nests. Within the wildlife refuge, 466 new green turtle nests and eight new loggerhead nests were laid in September following Irma. Along the other UCF-monitored beaches, 72 new green nests and three new loggerhead nests were laid. Still, the nests aren’t out of danger. UCF researchers have run a sea turtle monitoring and research program on the beaches of the Archie Carr National Wildlife Refuge in southern Brevard County for 35 years. Their findings about sea turtle nesting activity are among the reasons the refuge was created in 1991. Last year, the university and the U.S. Fish and Wildlife Service signed a landmark agreement that formalized UCF’s use of refuge facilities and established a protocol that will allow UCF to build research facilities and a plan that will give UCF oversight of the facilities for 40 years or more. To support sea turtle research at UCF, visit www.ucffoundation.org/seaturtleresearch.